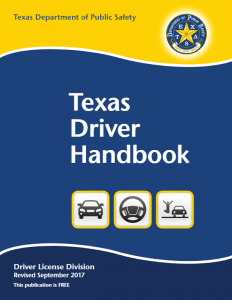 Texas Drivers License Test - Get a Free Texas Permit Test Guide Today! This Texas permit test practice module, with multiple choice questions, is intended to help you prepare for the Texas written knowledge test that is required before you can get your driver’s license. Passing the Texas Drivers License test is as easy as 1 2 3 using our online interactive driving practice tests with high-quality images. Study for this driver’s license practice test is completely free. If you have completed a defensive driving course, you may be able to save on your auto insurance premiums when buying a new or used car either by financing, leasing or through bank car loan. Gain access to hundreds of free realistic DMV practice questions and pass your driving test the first time! These FREE questions are the essential road rules you’ll need to know to help you stay safe and pass your permit test. These road rules questions are the essential road rules you’ll need to know to help you stay safe and pass your DPS test. Study all the laws, and then try a Texas permit test online, which will allow you to test your knowledge before you show up at the DMV. Take the practice test to Help You Prepare for the Real Thing. Updated 2019 from official Texas driver’s handbook. This online test is intended to help you prepare for your learners permit test that is required before you can get your driver’s license. Are You Ready for Your Texas Drivers License Test? Are you ready for your Texas drivers license test? If yes, great. If no, then contact us and let us help. We have practice tests that will help you learn and remember the information. We want you be successful and get your license. What do you need to do? First, get the driver’s manual and read it. Take time to learn the colors and shapes of signs. In the manual there are several pages of signs you need to recognize. Learn the speed limits in school zones and other areas of Texas. What else do you need to know? You need to know the law about drinking and driving. Knowing the law includes knowing the penalties and if you need to get an SR-22 certificate. Texas also has in-road lights that you need to know about plus variations of the usual red, yellow, and green stoplight. You need to answer multiple choices questions about what you should do when you see those. Pay attention to the rules about lines on the road. Make sure you read and learn the right way to make a left hand turn, or what a solid yellow line means. Find out where you stop at a crosswalk and when pedestrians have the right of way. Find out what that solid white line on the road means. Those are a few of the topics you will find in the driving manual. Download it today and then let us know when you are ready to try a practice test. Remember, we are here to help you be successful! A learner license, also known as an instruction permit, is a vertical license issued with a photograph and allows a student driver to legally practice driving when accompanied by a licensed driver. The licensed driver must be at least 21 years of age with at least one year of driving experience, must occupy the seat beside the driver, and cannot be intoxicated, asleep, or engaging in any activity that prevents him/her from observing and responding to the actions of the driver.